Often when you hear Brianna and Ben’s voices blend, they are hard to differentiate, picking each other up line by line, creating a warm colorful sound. Tigers Jaw plays Ernie Ball Power Slinky, Regular Bass Strings , MVP Volume pedal. Listen to Tigers Jaw below and catch a show near you. 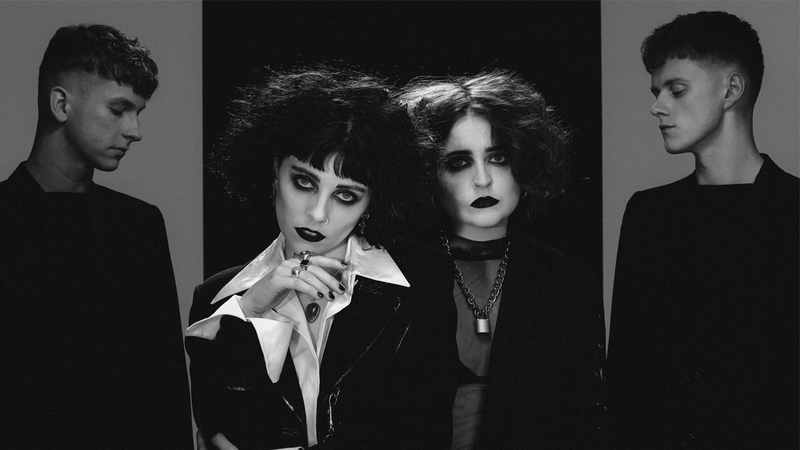 Hailing from the U.K., Gothic Indie rockers Pale Waves have made quite the impression in the states. After signing to the english independent label Dirty Hits, label mates and fellow Ernie Ballers The 1975 helped produce their first single “There’s Honey” . Pale Waves then supported The 1975 on their North American and European tour, only to come back to the states and sell out their own headliner. Pale Waves perform with Ernie Ball Regular Slinky, Regular Bass Strings, Regular Bass Strings and Poly Pro straps. Listen to Pale Waves below and catch a show near you. L.A. Witch is what you get when you combine the seedy grime of Los Angeles’ underside with cutting reverb drenched psychedelic guitars. The dark club sound sits perfectly with a time capsule of lost 45’s of underground cult bands. L.A. Witch released their self titled debut record available everywhere now, and have come off extensive touring in Europe, and will play Desert Daze Festival on Oct 12th in Southern California. Listen to L.A. Witch below and catch a show near you. From St. Joseph, Missouri, three homeschooled brothers started their family band and quickly started playing their high energy sets around the country. Opening for acts like Jack White, The Offspring, Descendents, and Titus Andronicus, Radkey has played SXSW, Riot Fest, and Coachella and followed up all the hype with a 2nd full length record titled Delicious Rock Noise. The heavy garage punk band has been so active their Dad quit his job as a loss prevention officer at Wal-Mart to manage the band full time. Listen to Radkey below and check out a show near you. Alexandr Misko is no ordinary acoustic guitarist. Alexandr treats his guitar like a drum, he detunes the string to have it follow the pitch of the melodies, all while creating an overall full sound with complex layers. He has released his second full length titled Beyond The Box with his very popular “Careless Whisper” and “Billie Jean” covers.